Last week I wrote about a wonderful source for bulk herbs and spices called AmeriHerb. I mentioned that they sell this amazing organic dark cocoa powder for $3.30 a pound. Well, they did. But now they don't. 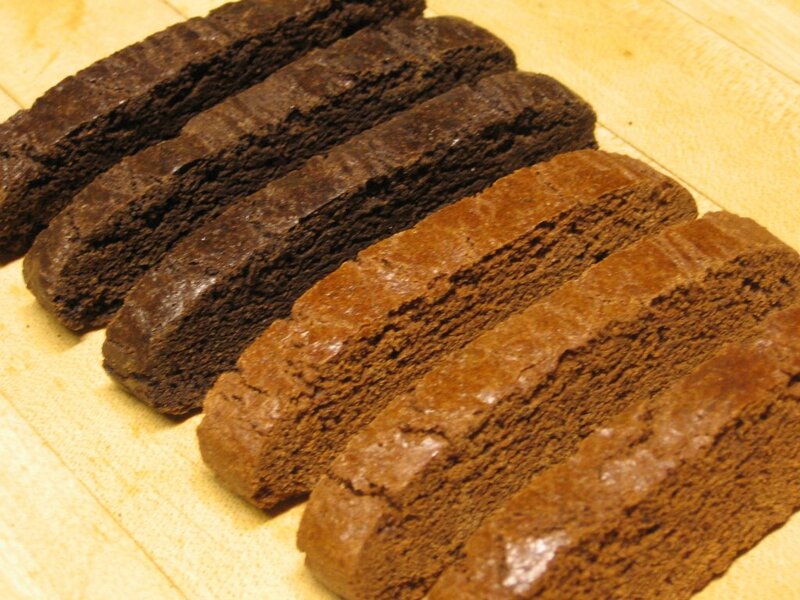 Last night I used up the last little bit of my "old" cocoa powder while making chocolate biscotti. And when I opened one of the bags I recently ordered, I was dumbfounded. The cocoa was a completely different color--and not in a good way. The old stuff was practically black. The new stuff looks like every other cocoa powder I've seen. Bummer. I emailed AmeriHerb today and was informed that my old cocoa powder was part of "a previous lot. The origin was from Vietnam, and it is no longer available in this country. To get more would triple the price. The cocoa you received is certified organic. Yes, it is not as dark." And true to their word that they guarantee all their products, they added, "If you would would like for us to credit, advise." Double bummer. This new cocoa looked and smelled fine and was still a great price especially considering it's organic, so I figured there was no reason for a refund. I did mention, however, that they might want to take the "dark" part out of the description since, well, it isn't anymore. And before I went and blindly recommended it to you, I baked another batch of biscotti with some of it this afternoon just to make sure it was good. Two thumbs up! I apologize about the false advertising. I know some of you were really excited about this special cocoa. The only thing I can say that might make you feel better is that at least you never tasted it. I get to live with its vivid memory tattooed on my tastebuds forever. I also have to decide if I should give away last night's double batch of biscotti for holiday gifts as planned, or be extremely selfish and keep it all for myself. When it comes to chocolate, sometimes I am not the kindhearted and generous person you might take me to be. And when it comes to special Vietnamese cocoa powder I will probably never ever taste again, well. . . as fellow foodies I'm sure you understand. And while my plan is to share my biscotti recipe in the next day or two, I'm not going to actually come out and say that here. I think the recipes I have promised and not yet posted (but have every intention of doing) is starting to pile up. If I don't watch out, you'll probably start referring to me as Fibbing Farmgirl or The Girl Who Cried Recipe. Gosh, maybe you already do. I hope not. Hmmm. I bet a biscotti or two would keep me from starting to worry. I am very glad I didn't get to try that cocoa! since am not there to order from yr supplier let me just talk about cocoa powder. Baked some cookies will post this weekend have no update yet.. used a local greek cocoa. arghh it taste a bit bitter. now am going to the deli (pay a handsome price of course) to look for belgian or dutch cocoa. that's a bummer about the original cocoa. but I agree with other FG friends -- it looks yummy! I am still not having any luck with the PITA bread -- my second go around was more promising than the first -- I had ONE puffed pita out of 8. None to worry though -- they make the very best pizzas. My whole crew gets excited about my PUFF-LESS pita breads! Have a great weekend FG! oh, that's bad, bad chocolate news...but I'm glad to hear the lighter chocolate does taste good. You would likely have to wrestle the dark ones away from me, though. Oh, please post your recipe: it would be a perfect compliment to some gifts I'm putting together for the holidays! Ha, I knew you'd be happy I can't get that incredible dark cocoa anymore. Belgian cocoa--now that sounds nice. Hmmmm. Not sure what the puffing problem is. Unless it's your "crew" wishing very, very hard that they won't puff so they can have pizzas! Those pita pizzas are pretty handy. I think I had them several days in a row for a while. Just plucked an unpuffed pita out of the freezer and had pizza in no time. Yum. Your photos keep me tied to my heart's home, the Arkansas Ozarks, while I'm temporarily living on Mars...er, I mean in Southern California. So, thank you every day, so much. Wow, those look great! I make a Christmas biscotti that's really chunky and hard to cut - chocolate chunks and almonds. Would L+O+V+E+ to try your delectable chocolate biscotti! Welcome to the farm! How wonderful to have a Vietnamese cocoa connection. If she does send you some, I would love to hear about it. By the way, I love your biscotti recipe. We use it at least once a month around here, since biscotti are my afternoon recharge. If you want the real dark cocoa powder, then try to get ADM's De Zaan Black powder.